Did I mention this is the view from my apartment?? ©R.G. Mmm markets have always been mythical to me. They have this exotic splurge to it. I don’t know why. Is it the romantic Meg Ryan movies? The Côte d’Azur novels? My aunts’ treats she brings from the French alps everytime she comes up to Belgium? Or the sailing in Brittany where life consists of market shopping, wine and food? We have them in our hometown back in Belgium but somehow I’ve never been to one. It’s just a matter of time management I guess? You either need to have your Wednesday or Friday morning off or you need to get up early on a Sunday or a Saturday. Neither of which will ever happen to me. But I’m in Sydney now! And this is what happens to you when you get to a new place, a new city, a place all the way on the opposite side of the world. You feel alive. You stop being lived and you actually start living. You start to make everyday count. You don’t just sit at home. You don’t just have a lay in. And when you do either one of those two you enjoy it to the fullest. So when I was having my housewarming party I decided to do it the proper way. The legendary way. I decided to do it with market products only. I decided to set out for sydney’s finest farmers market, take my time, linger, pick my vegetables right, have a little snack whilst browsing. You know just fully submerging in that market life where time stands still and the only worry is how you are going to carry these goodies home. Now the good thing was I had time, I actually had a couple of days off. Cause they weren’t a given the Sydney markets. Oh that’s right to fit the market vibe entirely, I have a brand new bicycle! You know the proper European bycicle with the basket in front. Yes it fits the market image perfectly! So it was on the Wednseday that I set out to my first market. 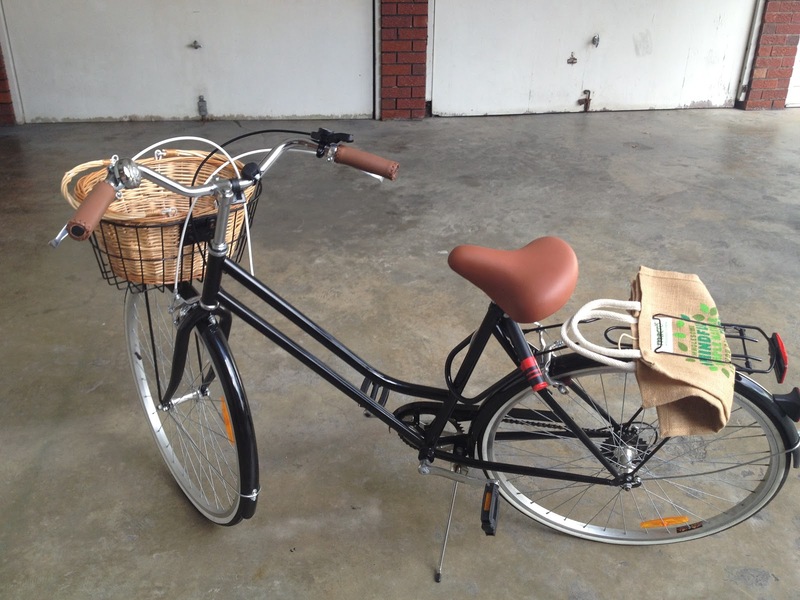 Now Sydney and bikes; it’s a real a hate-love relationship. Cause you are either going up and sweating the hell out of your living soul, squeezing every bit of energy out of your body or you are going down and feeling adrenalin rush, excitement and as light as air! So to travel a far bit south east, with just one hour of market time left and the knowledge that you have to be back up north east within the next 50 minutes for the sailing race, you have to be pretty committed. Well as god tends to punish those who arrive late, on a market point of view he has no mercy. Cause that’s the thing about markets. You have to be committed committed committed. You don’t just pop by when they are closing. You arrive early rather than late and linger rather than rush through. So yes I went up the hill, down the hill up the hill some more and finally down the hill to arrive to a deserted market. Just in time to go up the hill, down the hill, up the hill some more and finally down to hop on board in time for my twilight racing. 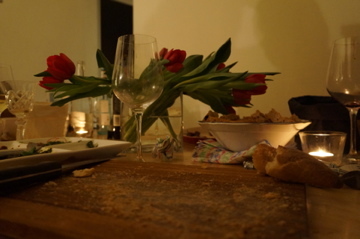 Housewarming the mess afterwards… not one crostini with pesto left! ©R.G. But no need to despair the party is only on Saturday. Here comes Thursday, Double Bay market is on. Here we go up up up up, very sticky and sweaty, up and one more up and down we fly to the market. Waw it consists of the full 6 stalls. Only two vegetable stalls, but some lovely snack stalls ( I deserved that after my climb), some beautiful honey, some delicious tomatoes and a wonderful marinade for fish or prawns. Right what else was I going to do today. It’s only morning remember? I decided to be committed this time. I thought of going to the beach, right? Little did I know that to get to the beach you have to add 7 more ups to the previous up. Plus I’m carrying just a tad more weight than the previous up. But who cares, I have the ocean on the other side. It was worth every drop of sweat. Blue wild ocean, incredible gold sand. What am I doing here in this paradise? Oh that’s right, I live here! Thank go there was a hot guy around to carry my bike back up after the swim! Honey, tomatoes and a marinade won’t cut it though for my housewarming. Why not do it on the way back from the beach? Yes, that sounds like a plan, an early morning swim, a good read and off we go to the market. By now I do know what I want and I can be more efficient. Yes! Back just in time to do my mise en place. Now I can finally rest in peace and go sailing with the sun setting and a good glass of wine in my hand. So what was I so committed to find on my market that you can’t find in the good old convenient convenience store on the corner? Ohhh the radishes! The radishes for the radish pesto. It’s an idea of my favourite foodblog (www.deliciousdays.com) it’s absolutely my all time favourite pesto. But you need proper radishes. Because you need those beautiful fresh crisp green leaves and good luck finding those in a supermarket. You need your proper farmers’ market for this. 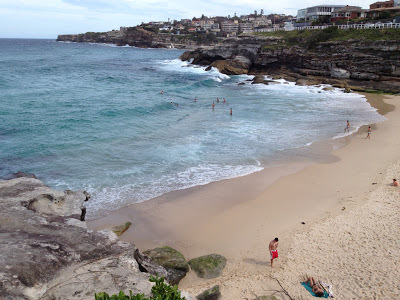 So thank you Sydney in spite of your hills, I still love you and your markets! Toast the chopped and skinned hazelnuts in a small pan over medium heat until golden brown and fragrant, then set aside. Peel and coarsely mince the garlic, then grate the cheese. Cut off the leaves from the small red radishes (I didn’t use the thicker stems) and wash them thoroughly under cold water as they tend to be quite sandy. Throw in a salad spinner until dry or pad dry on some paper towel. Put radish greens, toasted hazelnuts, grated cheese, a pinch of salt and black pepper as well as about 3/4 of the rapeseed oil into your kitchen blender and briefly blend until the pesto reached your desired consistency (of course you can also use a mortar). Add more rapeseed oil, depending on how saucy you want the pesto to be, then season to taste with more salt, pepper or grated cheese. Keeps in the fridge (always keep the surface well covered with oil) for several days. I never knew a Housewarming could be so filled with pre-exhaustion! And now I want you to find that nice hot guy and get him to take a picture of you ON your market bike!! All cold and grey here in Europe, so keep smiling in the sun, Lovely One. Previous story No worries mate, the salad ladies are here!